Washington (CNN) - Republican Rep. Mike Rogers told CNN Sunday he’ll “never say never” to the possibility of U.S. combat troops returning to the ground in Iraq to fight Islamic extremists. The question has come up in recent weeks as the Obama administration has watched the Iraqi leadership stumble in a bitter war against the terrorist group known as the Islamic State of Iraq and Syria (ISIS). Rogers, who chairs the House Intelligence Committee, cautioned that he doesn’t think sending in combat troops is necessarily beneficial at this point. But he also said President Obama is giving away too much strategically by placing such strict limits on the U.S. military role up front. Iraq is facing an onslaught from ISIS jihadists and is battling to wrest control of the strategically-located Mosul Dam from the militants, who recently took it over. As the largest dam in Iraq, it provides water and energy to much of the country. U.S. officials are concerned that if the terrorist group blows up the dam or opens the flood gates, it could endanger nearly 1.5 million lives and send floodwaters all the way to Baghdad, where the U.S. Embassy is located. The United States staged airstrikes over the weekend as part of a joint operation with Iraqi and Kurdish forces to take back the dam from ISIS control. When Obama authorized airstrikes in Iraq earlier this month, he said they would be limited to safeguarding U.S. interests and personnel and to help alleviate the growing humanitarian crisis. Even before the broadening of the U.S. airstrikes to protect infrastructure like the Mosul Dam, critics voiced concern about "mission creep" and have called for the President to seek congressional approval for further airstrikes. Rogers disagrees. "I don't think he needs to come back (to Congress) for an affirmative vote," he said, adding that although Obama has the legal right to authorize attacks under the current Authorization for Use of Military Force (AUMF), he should continue to work with Congress. "This president does not play well with others when it comes to this policy," Rogers said. "He should constantly be working with members of Congress who have lots of interests, lots of time, lots of experience with these issues. Then I think he wouldn't get into this problem of members being irate that he doesn't come to them for a vote." After president Obama lost the war in Iraq we had won; of course U.S. combat troops will be back Iraq to fix what the president screwed up; way to go – always wrong Obama. Didn't obumbles end the war ??? Arent all terrorist on the run??? Could it be Obumbles lied (again)??? Doesn't play well with others = won't do what I want, continue. Oh, so someone else who will never have to serve, or whose children will never have to serve in the military once again calls for US Troops to be on the ground in Iraq. This is why we need the Draft back. It will shut the pie-holes of idiots like this who don't have to worry about their trust-fund-babies ever having to serve in combat. 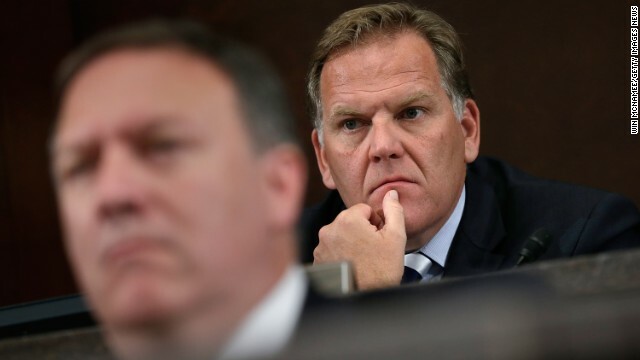 Look at Mike Rogers' face. Why do all the GOP males look like Lucifer? Rogers, Boehner, King. McConnell actually looks like the Grand Dragon. If anyone wants boots on the ground, please be sure you and yours are the first to sign up. We are sick of sending our kids to die for the wealthiest of the wealthy. You want a war? YOU GO FIGHT! He's not doing enough but he shouldn't do too much? never say never to combat troops in Iraq ...but just not now? He doesn't need Congress's approval but he should work with Congress? He should be constantly working with Congress so that members aren't irate that he doesn't ask them to vote? Yet,Congress's approval rate is at about 7% and is rapidly becoming irrelevant do to it's disfunction. The fact of the matter,Mr.Rogers,is that you would like to goad the POTUS into the same disastrous mistakes your own party made in investing the nations blood and treasure as well as our good name into the fools errand that is Iraq. What's wrong with never saying never? What's wrong with disinformation? What's wrong with emboldening your opponent into becoming overconfident and predictable? Besides, the Bush administration would have branded him as "un-American" or something for speaking out against the president regarding combat policy. Obama says "never" for troops in the Middle East, but sends them in anyway. At least this guy's being honest. These republicans who are war mongers should register their kids and relatives first to take the frontline in the war. From there people will understand we are serious in war. But just talking and letting your kids hide somewhere and others kids get killed, makes no sense at all. If we are in it all, let us all participate and not some.